UCLA recently snagged a place in College Magazine’s ranking of the Top 10 Most Hipster Campuses, coming in at No. 6, right above sister campus UC Berkeley. New York University secured the top spot. Wondering what a hipster is? Check out the video above to find out how UCLA students define the term. According to the College Magazine article, hipsters are “art loving, flannel-wearing, vegan-eating youths” who relish a bit of witty banter once in a while. Criteria for the ranking included the number and quality of: Sustainable and Vegan-Friendly Eateries, Nearby Cities, Liberal Arts and Fine Arts Programs, Fashion Schools, Nearby Boutiques and Thrift Stores, and Radio Stations. UCLA met the criteria on shopping options, vegan-friendliness and strong liberal arts and fine arts programs, according to the article. Is the ranking accurate? And what does hipster really mean, if anything? You tell us. Tweet us your thoughts @dbmojo or comment below. 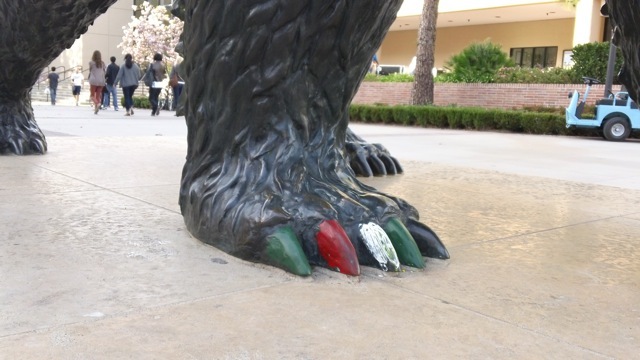 Someone treated himself to a pedicure during break. … Interesting color choice. Thoughts on the new look? Construction workers lined up trees in planter boxes along Gayley Avenue this weekend at the construction site of the new Holly Ridge and Gardenia Way De Neve residential halls. Between 80-90 trees will be planted on the site, one member of the construction team said. The new residence halls are scheduled to open in February. “There’s going to be quite a bit of trees that weren’t there before,” said Frank Montana, manager for special projects and services with the Office of Residential Life. A few trees are also being rescued from other parts of campus. Between four to eight trees will be transplanted from the Sproul Cove construction site, Montana said. Another tree currently stationed near the Hilltop store will also be re-planted on the De Neve site. With less than a month remaining before students will be moved into the dorms, construction is now in the “softscaping” phase, Montana said. That includes building walkways in addition to greening up the landscape. If you’ve got Java, you can check out construction on the Hill on university webcams.